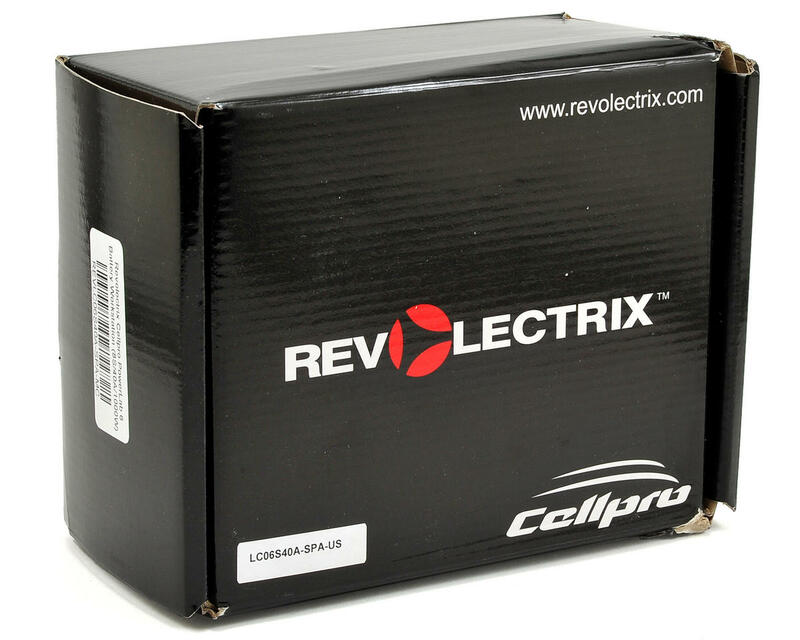 The Revolectrix Cellpro PowerLab 6 Battery Workstation is built on the same framework as the original Cellpro PowerLab 8, and offers a virtually identical feature-set. Capable of charging, discharging, monitoring, or performing multiple cycles on any current or future battery chemistry at alarming speed, PL6 is optimized to balance the need for high power, high current operations against the need for small size and affordability. The PowerLab 6 consumes some 23% less volume (size) than the original PowerLab 8. In keeping with the PowerLab philosophy, at $0.16 per WATT, it blows the lid off the competition and represents unprecedented VALUE. But power is only one part of the equation. Read the information, and talk to people who own a PowerLab and they'll tell you why and how it out-paces any other brand on the market in terms of it's rich feature-set, ease of operation, as well as it's expandability. You will be hard pressed to find a more stream-lined user interface, or more capable, native, and free P.C. software. Add to these facts, the industry's first, well-conceived plan to support safe parallel charging of virtually any number of same-cell-count packs all at once, and you will realize that the investment in PL6 has paid for itself many times over. You no longer need more batteries. You need a battery workstation that can charge, discharge, cycle or monitor many packs faster than you can fly them to depletion! The Cellpro PowerLab 6 Battery Workstation directly supports all Cellpro Revolectrix battery packs by using the PowerLab basic adapter (available separately). 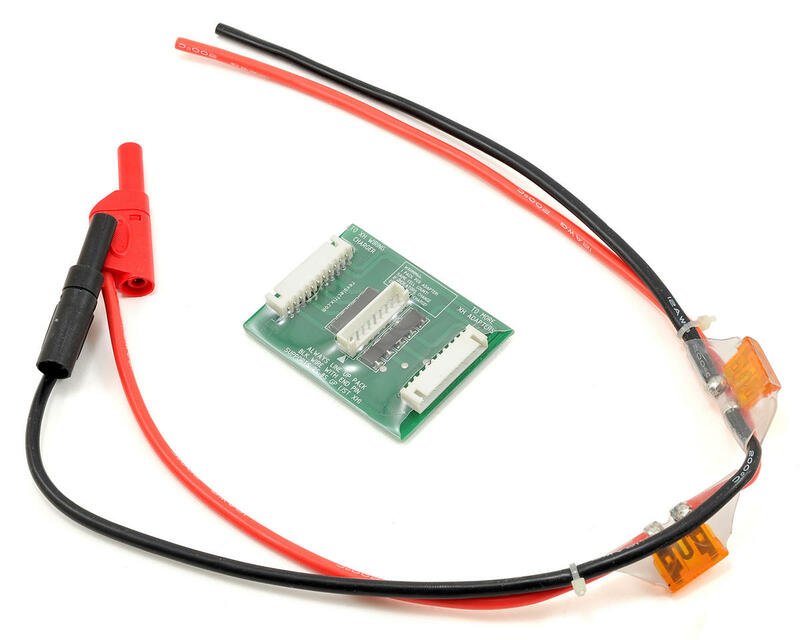 Revolectrix also sells adapters separately to interface with various manufacturer's batteries, including the safe parallel adapters which can be daisy-chained to allow simultaneous, safe parallel charge of multiple packs. PowerLab 6 uses the same adapters as PowerLab 8. If you already own PowerLab 8 adapters, you are set. Power is important, but means little without SAFETY, RELIABILITY, FLEXIBILITY, and INTUITIVE OPERATION; the key elements that are painstakingly crafted into the Cellpro product line. The competition will come along with powerful chargers, but they will have trouble harnessing this power. From the massive, over-sized heat sink, to the large cooling fan. From the 40A, 1000W (@ 30VDC/40A input) synchronous charging circuitry, to the 1000W capable "regenerative discharge" capability, everything about this all-inclusive battery management system screams EXCESSIVE. Do not be scared off thinking this is too much charger for you. This may be the safest, simplest charger you will ever use. That's because it's a Cellpro, and being a Cellpro, that means you can not make a mistake when you use it. It simply will not let you. The charger will never let you charge a LiPo by selecting the wrong cell count. It knows how many cells are connected by monitoring charge voltage on each cell in the pack individually. It performs an entire series of tests to make sure the battery is hooked up correctly to the charger before it starts to charge, checking for valid voltages on each cell, reverse polarity conditions, reversed node wiring to name a few. It constantly monitors the total pack voltage and compares that to the sum of the individual cells. It can not and will not ever charge a single lithium cell above the proper end-of-charge voltage, and because it is a Cellpro, it assures you of the most accurate, laboratory quality readings at all times. Every single Cellpro charger is factory calibrated using custom test equipment developed by the engineering team at FMA in the United States. Furthermore, if a pack has been over-discharged, it will automatically enter low-voltage restore mode. It will reduce charge voltage during cold weather to extend battery life; all parameters associated with this feature can be adjusted by the customer. Even though batteries in general, and especially lithium batteries, are potentially volatile, the PowerLab 6 reduces the risks associated with maintaining any size battery, any chemistry by magnitudes over other brands. Safety has always been at the forefront of all FMA charger designs. PowerLab 6 represents the next phase in the evolution of safety. 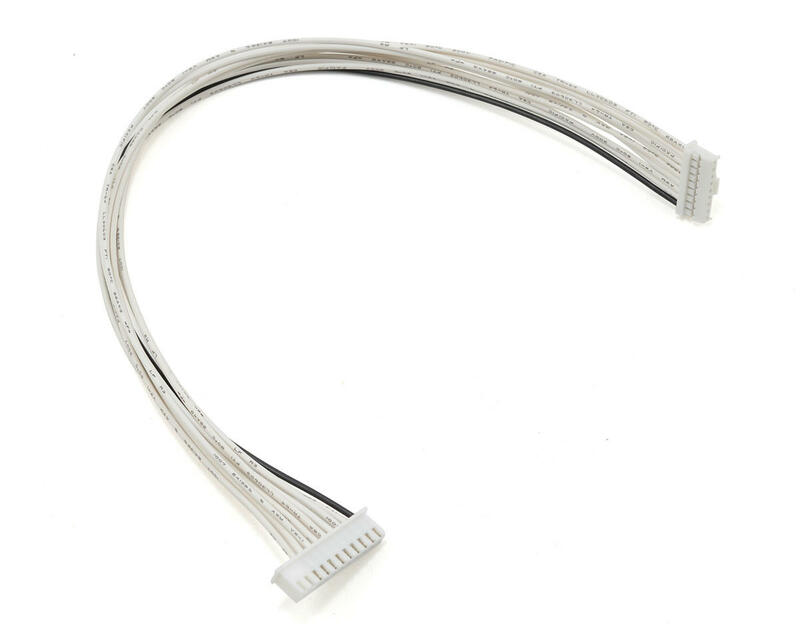 Take top-notch components capable of handling all of the stresses associated with super-high power, high voltage operation; things like an over-sized heat sink, extra-heavy 12AWG input wire (now terminating in an EC-5 female pin connector), a large cooling fan and a gigantic sendust core toroid inductor to handle higher input current and combine these with stable firmware/software that is thoroughly tested in-house and with outside beta testing, and what you get is a new standard in reliability. 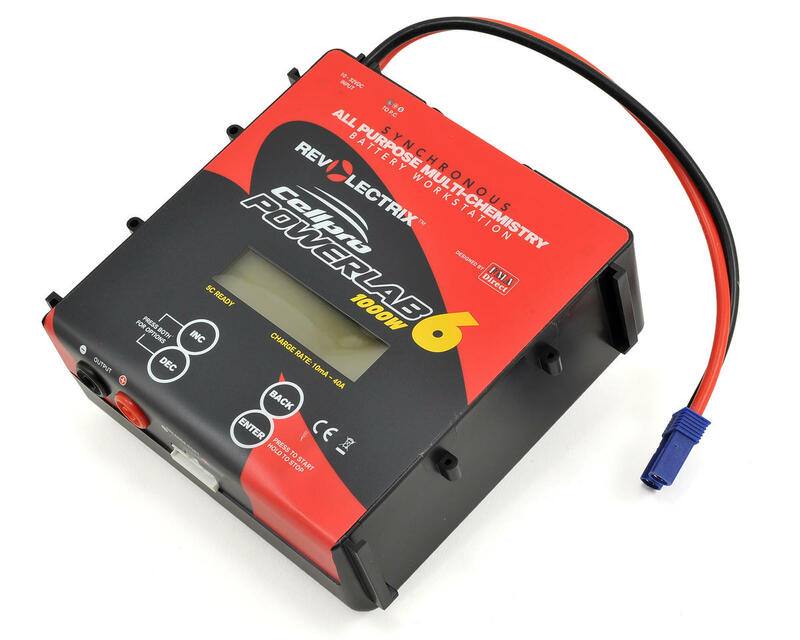 Revolectrix doesnt like getting chargers back from the field for any reason, and they have gone the extra mile on the PowerLab series to prevent it. The Cellpro PowerLab 6 is not just another charger on the block. In fact, it is not just another charger at all. It is an all-encompassing battery management and analysis tool. It is compact, powerful, and easy to use. Combining this kind of performance with the ability to autonomously cycle batteries, graphing all aspects of charge and discharge at the cell level (using the free Charge Control Software) and over multiple cycles provides you with key information about any chemistry battery you might have. It will tell you the quality of your battery by monitoring and graphing internal resistance at the cell level; more accurately and faster than ever. It will maximize the health of your batteries and it will quite possibly re-juvinate batteries you thought were beyond repair. It will do all of this faster and more accurately than other chargers by means of the industry's highest (and adjustable) power balancing current available. After all, what good is 40A of potential charger current if you back it up with spindly balance current? But most importantly, through the type of data the PL6 can provide, it will tell you if you are safe to fly with your battery. And when they say flexible, they mean it! Simply by calling up the appropriate User Preset, it's EASY to go from charging or cycling something like 40AH, 6s worth of batteries at 40A continuous output in a little over 1 hour, to a 20mAh, 1s LiPo at 10mA. So you don't have a 12v, 500W or a 30v, 1200W power supply lying around? Not many people do. With smart power management in the PL6, it's easy to limit the unit's input current to match what you do have. This innovative feature has been standard on Cellpro chargers for years but has been vastly expanded in the new PL6. It is now possible to create 2 unique and custom Input Power Source profiles. Using the CCS, begin with a template and adjust parameters to meet your needs. Or enter the appropriate parameters right at the charger. Then easily choose between "Battery" or "Power Supply" input each time (and one time) before you start to use the PL6. Now, thanks to the new 4 button, intuitive interface and high capacity micro-controller in the PowerLab 6, adjusting power limiting at the CCS or at the PL6 just got a whole lot easier. But perhaps one of the coolest features that makes PL6 the "greenest" battery management system on the planet, is environmentally friendly, regenerative discharge capability of up to 1000W. Unlike traditional methods of discharge, which deplete the output battery's energy in the form of heat across a transistor, regenerative discharge takes most of that energy and puts it back into the input battery. In other words, when you discharge your LiPo for storage, you will be re-charging your Lead Acid input battery. The total amount of power that you can achieve is limited only by the amount of current that your input battery can accept, or 1000W, whichever is lower. Regenerative discharge is an optional feature. Turn it on when you need the highest power discharge. Turn it off and use standard internal discharge of up to 50W if you choose. The original Cellpro 4s introduced the whole idea of a super-safe, super-simple charger with power balancing built right into the charger. The Cellpro 10s expanded on this theme enabling customers to do two batteries simultaneously. It also introduced the concept of two-way P.C. communication opening up new doors into customization at the customer level, not just in terms of printing graphs, creating or modifying presets or charger settings, but in streamlined and 100% reliable firmware updates. Cellpro Multi4 took these concepts and extended them to multi-chemistry batteries and open architecture presets, fully customizable with some 80 adjustable parameters. Still, the chargers are easy to use and fool-proof. Sure, they are rich in features, but designed to be simple to use and simple to understand. Cellpro PowerLab is the epitome of the Cellpro philosophy. Its basic operation is patterned after the Multi4, so if you have one of those, you will instantly be familiar with the charger as well as the free Charge Control Software (CCS). But the unit sports a totally new 4 button interface for accessing information. Let's face it, with 4 buttons, it's just easier to use. When REVOLECTRIX says "Designed by You", that's what they mean. Industry's first "daisy-chainable" Safe Parallel adapters available to maximize available power potential. Safely connect virtually any number (2s-6s for any brand or 2s-8s Cellpro compatible) of equal cell count/capacity together in parallel; charge, discharge, cycle, or monitor on a single PowerLab 6 unit. Parallel adapters are not included as a part of the basic PowerLab 6 unit. Initiate charge, discharge, monitor, and multiple cycles at the PL6 or via remote control from the CCS. Graph all major operations when using CCS. PowerLab 6 is also equipped with a traditional, 50W internal discharge capability which is non-regenerative. Expansion Channel mode whereby one PowerLab 6 Primary (Master) can control one or more Expansion Channel Units, send over preset information, control all aspects of charging and balancing. This feature is perfect for charging multiple packs of same chemistry using multiple devices such as split packs connected in series during operation all at unbelievable rates. NOTE: * For safety reasons, available charger current may be limited for certain battery types and/or charging modes, e.g., non-balanced charge of Lithium batteries. ** Please check bullet number 9 in the section titled “Major Features” (Features tab) for a detailed description of Regenerative Discharge. All specifications and features listed above subject to change without notice. This charger was very very good when I first got it. But it came out of the box with the front facing balance port bent inward on one corner, but I wasn't worried about it to the point of sending it back. But I should have! Overall, The charger has a load of features that make the thing one of the best on the market when it worked, but within the first month it all of a sudden started to tell me I had "bad node count" with a warning buzzer that subsequently would drop the charge all together. This cost me a couple of races ultimately because I couldn't be tending to my charger while I was running heats or helping turn marshal. I read some forum reviews on the same problem others where experiencing, from which multiple opinions and suggestions arose. Rather than attempt to send it in, I cleaned the balance port and mail plug end and cheacked every line for any damage or broken connections. But to no avail. I finally opened up the case and had a look around to inspect everything thoroughly. Everything seemed fine by sight, as all the solder joints looked to be good. I also straitened the way the balance port set, hoping that by straitening out the terminal it might possibly fix the issue. No good, still fails consistently. Past that, while I had the case apart, I got a chance to see how things where engineered. While the inner board its self is suspended rigidly via alloy risers, the metal lid part that supports the buttons and LCD screen is poorly thought out in design and fitment to the plastic lower case half. While I understand manufacturing cost, this was not a cheap piece of equipment, and the structural craftsmanship should be of a higher standard, which might have prevented what ever happened to my charger from happening to it to begin with. The only thing I know is, if it had that bent port originally, then maybe it was dropped. Regardless the design issues along with the fact it was expensive has aggravated me to the point that I decided to just buy an iCharger 406 Duo and forget about the FMA stuff till their quality improves. I'd like to think I just got a dud, but it is what it is though.